Industry & Leisure in the Watchung Reservation: The Deserted Village of Feltville ~ The History Girl! Tucked away in the woods, on a dead end road not far from the hustle and bustle of Route 78 is a deserted village in Union County. A once-thriving village, it appears as if nature is slowly taking its revenge on the property. The historic and noteworthy Deserted Village of Feltville/Glenside Park relates the all too familiar story of boom and bust. Preserved as open space early in the twentieth century, this has enabled Feltville to survive past its prime and become a teaching tool for an oddly placed rural industrial community. The first settler to the area where Feltville stands today was Peter Willcocks, an Englishman who moved to the area about 1736 from Long Island. Peter realized the potential of the Blue Brook and built a dam across it to harness its power. He constructed a saw mill along the brook, from which he used to produce lumber from the abundant forests and consequentially sell to settlers in the surrounding countryside. The land he cleared became farmland for his family. David Felt was a successful New York businessman who owned two stationery stores, one in New York City and one in New Orleans. He conceived the idea of establishing a manufacturing facility outside of cities such as Paterson and Newark. In 1844, he began purchasing property totaling 760 acres and the water rights to the Blue Brook from Peter Willcock's descendants in order to establish a stationery factory. 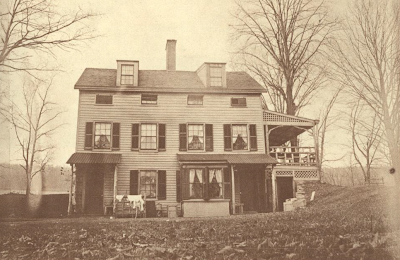 Between 1845 and 1847, he retrofitted the property along the Blue Brook, which would become the base of operations for the soon-to-be-established Feltville. With this purpose in view, he enlarged the mill, rebuilt the mill dam, and installed new machinery for the manufacture of paper, the printing and binding of books, as well as the production of stationery for the trade. One of the new improvements in his plant was the installation of a dye-house and equipment for making marbleized paper, in which he had developed a special interest. Because of the property's remote location and poor road conditions, Felt needed to import and house his workers at the property. On the property he built a large mansion for his family, twenty-four houses for his workmen and their families, a boarding-house for unmarried men, a schoolhouse, church, company store, a large store-house, a blacksmith shop, and a barn. The homes he constructed were built in the Greek Revival style. The style is particularly evident in features such as the symmetry of each design, the use of small rectangular windows to light the top floor of most of the homes, the presence of simple wooden window and doorway moldings, and plain fireplace mantels. The homes were divided down the center, creating a two-family house. Each side had its own fireplace and staircase. By 1850, 175 residents were recorded in the census. Felt’s store was a focal point of the community. It carried general merchandise for the residents and was patronized by the farmers living nearby. The second floor was used for holding religious services. Felt believed that worship was an important aspect of village life and he provided ministers, priests, and rabbis to conduct religious services weekly. Austin Craig, a non-denominational minister, was hired to remain in full-time residence. A one-room schoolhouse was located in what is today the parking lot at the top of Cataract Hollow Road. Felt’s incorporation of a school and religious services in his village demonstrated that he was concerned with developing a well-rounded community. Felt’s paper mills produced the following products: Blank-books, stationery, ruling of writing paper, general book-printing and book-binding, marbleized paper for books, and the publication of advertising material and posters. All publications bore the imprint "Stationers Hall Press, Feltville, N. J., David Felt and Co., Stationers and Printers." Feltville survived for fifteen years under his watch. In 1860, he was sixty-seven years old. Felt sold the property to Amasa Foster and returned to New York City. Why Felt sold his business and left New Jersey is not entirely clear to historians, but there are a number of theories. His advancing age and lack of heirs to run the property may have been a consideration. His brother Willard, who managed the New York operations, was sick at this time and Felt may have been compelled to keep his retail operations running rather than the Feltville factory site. The factory site itself was becoming outdated, as new factories were beginning to be run by steam-power rather than water. Also, these new factories were closer to cities and transportation routes, making it easier to get goods to market. Lastly, the impending Civil War may have put a strain on the business and trade with the southern states, although this theory may be more coincidence than fact. David Felt passed away in 1873 at the age of eighty. 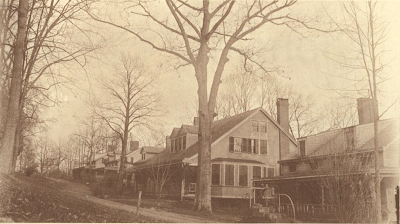 Cottages during the Glenside Park era. 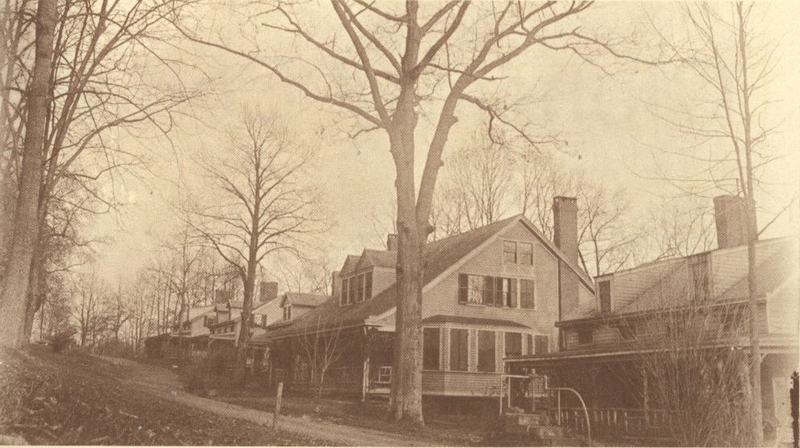 On August 9, 1882, Warren Ackerman of Scotch Plains purchased the Deserted Village property for $11,450. Shortly after the purchase, new life quickly filled the village property. Ackerman was eager to transform this industrial property in the wilderness into a placid summer retreat with modern conveniences. The bell tower and three-story open porch was added to the company store building. A number of the cottages were restored and furnished. Dormers were added to the second floor of the cottages to make them more spacious. Wide porches with Adirondack-style cedar posts and railings were built. The property was renamed Glenside Park. The resort offered many amenities such as an inn for dining, dancing, and other social activities and the grounds were host to golf, tennis, croquet, baseball, horseback riding, hiking and fishing. A stage coach service was also offered for businessmen during the week. In 1882 a barn was built to house the horses and carriages for the stage route. The Masker's Barn in 2012 after restoration. Guests were able to rent the cottages by the season, with rates ranging from $100 to $250. Table board at the inn cost $9.00 per week per person. Children were $7.00. The day-to-day operations of Glenside Park were managed by Mr. Frank Hasniger and Mr. and Mrs. Molloy. The venture proved to be successful for many years, attracting a number of families from Newark, the Oranges, and New York City looking for rest and relaxation in the Watchung Mountains. However, by the early 1900s, the automobile began to creep into Glenside's allure, as families could now travel further in less time. By 1916, Glenside Park closed and yet another reincarnation of Feltville faded away. Between 1919 and 1927, the property in and around Feltville was sold to various individuals. Some buyers restored their cottages and moved in, while others rented to transient guests. 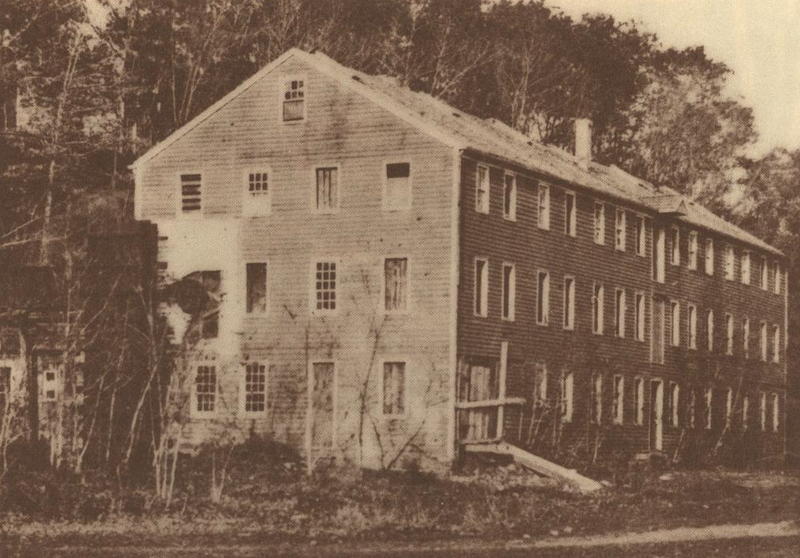 In 1930, Felt’s former mill, which during the resort’s time had been used as a stable for cattle, was torn down after being declared a safety hazard. Cottage during Glenside Park era. In the 1927, the newly-formed Union County Park Commission began buying much of the property and began renting the cottages out to families who lost their homes during the Depression. The cottages were once again filled and the community flourished through the 1960s. After the 1960s, Feltville's popularity began to wither as new, modern suburban homes became cheaper and more readily available. The site was listed on the State and National Registers of Historic Places in 1980. In 1992, stabilization work was performed on all of the buildings. Within the past few years, the company store and the Masker's Barn have been restored. The Deserted Village is once again reviving itself after near-abandonment. This secluded village sandwiched between suburbia and busy highways, is one of the last standing quasi-preserved mill towns of the nineteenth century in northern New Jersey. While the mill and ancillary buildings which were the reason for this village no longer stand, the remaining cottages pay homage to the resort period and remind visitors today of the tranquility that was foreseen by William Ackerman in 1882. Video of Feltville on Youtube. I was a Union County Police Officer in the 80s. Satan worshipers would conduct crazy ceremonies and animal sacrifices all the way in the back of the village. Super interesting post! I never heard of this place.